Many of our guests, long time members, and friends are inspired by the dolphins and sea lions they come to know here at Dolphin Research Center. Those of us who are honored to work here are always so inspired by our animal family that we've coined a new term - "finspiration"! Every day, we're able to talk with guests about our experiences. Now, we'd like to share your stories too. How have the dolphins and sea lions finspired you? They can be finspirational in small ways - like encouraging you to do more recycling or reminding you to be more conscientious of what you buy and its hazards to the environment. You might be finspired in larger ways - Ways that make you pursue your dreams of one day working with marine mammals, or make you more determined to achieve life changing goals. However you've been finspired, we want to hear from you. We hope you enjoy reading the stories on our site. If you have some of your own, we'd love to hear them. Please send them to us via email at fins@dolphins.org. I knew upon introducing myself to this group of swimmers that this would a different kind of program. But what I didn’t know is just how unforgettable it would be. These 6 people were from Germany and only one gentleman knew very little English- enough to read my lips and translate in Sign Language. These two families were deaf. The children placed Merina and Windley’s symbols into the water at the beginning of this special session. Their faces lit up in surprise when Merina popped up and smiled hello. Doug, our Special Needs Co-ordinator, was right there with me- he always is in the right place at the right time. I began their swim from the dock. Doug was in the water with the families. Merina and Windley started off the session squealing in delight, and then something happened. All was quiet. Silence, when associated with our public programs could be deemed as awkward or uncomfortable, even empty. I am not the silent type. Well, neither is Merina for that matter. We are always chatting and rarely quiet. Today was different. This silence was so full of joy and bliss and all things good. It was the most beautiful and meaningful silence. I felt detached somehow being on the dock, and I really wanted to make sure these families connected with Merina and Windley. I got into the tray with them, and Doug hopped out. We didn’t even speak to each other- it’s like we just knew what to do. We simply went with the magic of this quiet encounter. No one spoke. I placed the children’s hands on the water and Merina and Windley came over for a back rub. Astonished gasps broke the silence and Merina squealed. 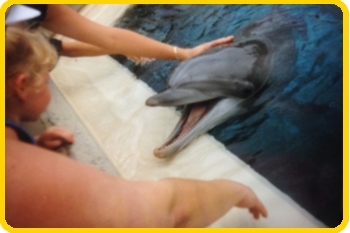 The children smelled their hands after touching the dolphins, and one little girl licked her hand. They were truly using all their other senses and having an experience like none other. Being with them in the water enabled me to place their hands on Merina’s melon to feel her echolocation. They could feel the air out of her blowhole when she made her razzberries, chuffs and foghorn sounds. Their hands were just like their personalities- so quiet, so gentle. No sudden movements- everything was quiet and delicate. This swim was like a whisper- soft and sweet. For dorsal pulls, I placed their hands on Merina’s dorsal fin and then reached for them as Merina and Windley brought them back. Merina and Windley were so careful- Little Windley seemed so grown up to me all of a sudden. There wasn’t a single moment that these girls didn’t fill. Each moment was amazing. This silence was so full of joy and wonder and love. So much communication, so much understood. So few words. Merina and Windley for the first time and didn’t stop until after she was out of the water. I embraced this quiet. I still do. My heart is thankful for Merina and Windley. My dolphin friends never cease to teach me and amaze me. I am so honored to have been a part of this silent symphony. I am Sammie Jo M. and I wanted to tell you all how much DRC helped to inspire me and give me the tools I needed to follow my dreams during their 3 week Teen Dolphin Lab course. I went to the lab when I was 17, and I am now 22. My dream ever since I was little was to become an animal trainer/ rescuer, so I decided to attend the course in the hopes that the information I learned there would be helpful on my way to accomplish my passion. Not only was it helpful, it was priceless. Over three weeks I learned more about training through their hands on program than I had previously learned, and the information proved invaluable when training 12 rats for my psychology senior thesis paper this past spring. This paper and the experience I gained from working with rats and dolphins gave me a tremendous boost above my peers when I was applying for work as I graduated this summer. I am happy and pleased to announce that I am now currently working as an animal trainer in Ireland working with birds of prey. Owls are my favorite animal, and I got to train a barn owl first thing when I arrived! I could not have achieved my dream without hard work, dedication, and Dolphin Research Center. Thank you to all the staff at DRC, without your valuable insight into training, I could not have done it! I'm only 13 and last year my mom and I went down to key west and did your Trainer for a Day... It was amazing. 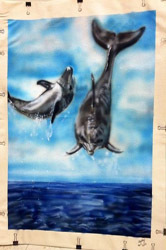 My fascination with dolphins started when I was 2 or 3 years old. My family and I went to SeaWorld Orlando. When I saw the dolphins, it was like love at first sight (as my father puts it). I don't remember much since it was 12 years ago, but apparently I wouldn't stray from those dolphins no matter how much I was bribed. The dolphins are so playful, yet so calm and peaceful, and that permanent smile just makes me happy! I ended up leaving that day with a pretty big dolphin stuffed animal that I never left out of my sight; I still sleep with it to this day. My dolphin obsession has lasted forever. My room was once decked out with everything dolphins. My walls had dolphins on them, I had dolphin decorations, and my bed spread was dolphins (currently, I have a whole section of my room filled with certificates of adoption, biographies, tail fluke information cards, and pictures from DRC). People still call me the "dolphin girl" (which I'm very proud of). Now fast forward to the summer of 2012. For my brother's girlfriend's birthday, my brother and I planned out a surprise of swimming with the dolphins (she loves dolphins as well). We chose Miami Seaquarium because of its proximity to our house. 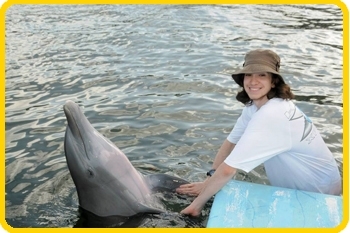 This would be my 2nd time swimming with dolphins; my first was in Mexico when I was 8 or 9, but I don't remember much. After swimming with the dolphins, we came home and my brother's girlfriend, Carly, blurts out "I want to adopt a dolphin!" I've never even heard about "adopting" a dolphin, but it sounded interesting. We both search "adopt a dolphin" and the first thing that comes up on my search is Dolphin Research Center. I was amazed by each dolphin's biography that I had to adopt one. Before consulting my parents, I wanted to choose my new adoptee. It came down to Pax, Tanner, and Jax. Jax stole my heart, Pax reminded me of my brother, and Tanner was so interesting and his birthday was close to mine. As a result, I chose Tanner. My parents were okay with the whole idea, probably because they were in Europe and didn't want to be bothered by me whining about how much I want to adopt Tanner. On June 9, 2012, I became a Dolfriend and a member of DRC. Once my parents got back from Europe, I begged them to bring me down to DRC. Finally, they agreed. It was sometime in December when my dad and I drove the 2 and a half hour drive down to DRC. This place was a wonderland. I was amazed at how natural everything was. The first thing I did was locate Tanner. Of course I wasn't keen with identifying each dolphin, so I probably called AJ Tanner and brought home pictures of AJ instead of Tanner. I was, and still am, so happy that I saw Tan Man. I also signed up for a Dolphin Encounter that day, and I was finally called. I was with Santini, and I cannot describe how awesome the experience was. Before we left, I purchased a Tanner fluke tail and a Santini fluke tail. Over the years, I've collected 6 others, including Molly, Rainbow, Reese, Delta, Pax, and Sandy. I wear my necklace every day! Over the course of almost 3 wonderful years, I've participated in too many Paint with a Dolphin's to count, a Dolphin Explorer, a Dolphin Dip, 2 Play with a Dolphin's, a Trainer for a Day, and a DolphinCamp. Trainer for a Day was one of the happiest days of my life. I was gifted TFD for my birthday, and I did it during Spring Break, maybe 2 or 3 weeks later. I was greeted by my trainer, Sam E., who was (still is) one of nicest people I've ever met. She showed me the ACT office and the schedule board, which was really cool to see. I also got to play with Pax (who I ended up adopting at the end of the day), and take a picture with him! We went out on the boardwalks and watched a dolphin enrichment session. Then we visited baby Reese! Reese was getting used to hands at that time, so we just watched him get closer and closer to us (on Reese's birthday, I woke up extra early to adopt him, and became a Pod Pal). We also played with Cayo, I swam with Tursi and Gambit, got a shirt painted by Santini, hugged Karen, and had an experience of a lifetime. That summer, I had another experience of a lifetime, DolphinCamp. DCamp was filled with awesome memories and friends. I loved every second of it, whether it was classroom time, snorkeling, fun games, learning about medical behaviors, watching sessions, or just hanging out in the dorms. I'm ecstatic to say that I'll be coming back to DRC this summer for 2 weeks of DolphinLab. I have WAY too many memories at DRC, but there's a whole lot room for more, and I'm excited for this summer, and the future with DRC! Thanks for everything that you do! It wasn't a special day. I can't recall when or what was going on, but I found myself watching TV. It was some unknown channel I never regularly watched, but when I saw it involved marine mammals, I stopped to see what it was about. The facility they spoke of was called "Dolphin Research Center", and something about it was instantly enthralling. I immediately saw that this place was special. It was unlike any other dolphinarium I had ever seen. I'd worked in large zoos and aquariums before, but Dolphin Research Center had something they didn't. For as long as I can remember, I've dreamed of having a job caring for marine mammals. I love animals, and I was always an adept swimmer, so it seemed the perfect career choice. I was never fond of excess like large cities or multinational corporations, but there seemed to be no place to find a job in this field that wasn't a large scale aquarium. They're fine places, but the size of them just wasn't for me. Then I found Dolphin Research Center. Watching my tour of DRC on TV, I saw what I had always imagined was the ideal location for marine mammal care. These dolphins were more than just research subjects, they were friends. I began research of my own to discover more about DRC and what they stood for. It was about six months later that I had an opportunity to visit. I didn't have a lot of money to throw around, and the the journey that weekend ended up being more of an adventure than a vacation. When I first stepped into DRC, I was amazed at the simplicity and small size of the facility. It felt less like a business are more like a home. The relationship between the dolphins and the staff was unlike anything I've ever seen before. I was never motivated by a desire to be in this business for recognition, and the staff displayed a level of passion and dedication that made me feel I was among peers. Both human and dolphin alike were excited and energetic throughout the entire day, and when I met Merina and Tursi up close, they seemed like the happiest animals on earth. As wonderful as the personal experiences were, there was omnipresent a scientific endeavor that drove the facility. DRC presented me a unique stimulation that was both scientific and spiritual. The study of the unique animals living in the lagoon was as fascinating as the interaction. As the day neared it's end, a commotion began around the back of the lagoon. I approached to discover I would soon bear witness to the miracle of a dolphin birth. I don't know if I could say I believe in fate, but this one visit, on this one day, yielding a spectacle of this caliber, seemed almost like a sign. That warm November afternoon was more than I could have ever wanted. The calf I saw born was eventually named Delta. I decided I would watch and support Delta through his life, and have been donating to DRC every year since then. Someday, I hope to join the DRC staff, to personally care for Delta and his entire family. The opportunity to work my dream job at DRC would feel much like winning the Super Bowl, and I can't wait to take my support of marine mammal care and research beyond mere donations. Until then, I'll do all I can to help. Someday I'll return, either as a guest or, god willing, as a dedicated marine mammal care professional. I can't thank you enough for all the memories, and the opportunity to share them with you. 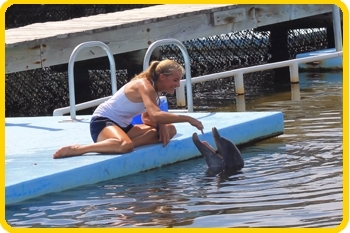 My Finspiration started when I was only 4 years old and I first visited the Dolphin Research Center. I have since been a member and visited many times. I have two stones, one in the veterans’ garden and one right outside the gift shop. I participated in daily interactions such as a Paint when I first visited (in fact, I still have my original and two more recent shirts) and an encounter in 2011 with Pandora and Luna. Since then, I participated in three dolphin labs (Basic, intermediate, and MMC&BT), and most recently, I participated in a ‘Trainer for a Day’ program working with Pax, Talon, Sandy, and Rainbow. I was able to witness a session with Pandora, and help feed Calusa just days before the two gave birth to their lovely calves. Living in Northeastern Pennsylvania, I am completely landlocked but thanks to my trips to Florida and my grandparents introducing me to dolphins at a very young age I have learned that the ocean is a magical place that we know very little about and have to protect. To learn about the animals and their social lives, we need them in the care of humans, which led me to make people aware why facilities such as DRC, SeaWorld, and others are needed. DRC and their many animals inspired me to stick up for what I believe in no matter how many miles I am from the situation and how many people disagree with me. I am a strong advocate for human care and work hard to make others aware of the situation and way these animals are needed; not just for our entertainment but to learn from and for them to teach us. People think you can learn all you need from movies like Blackfish and people like Ric O’Barry but when you read stories like Killing Keiko and listen to people like Kyle Kittleson you don’t need access to a marine mammal facility to see why we need them in our society. I am also planning to work on a degree that will lead to a job working as a Dolphin Assisted Therapist. 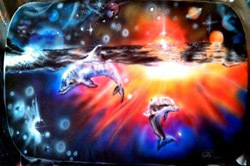 Dolphins have impacted me in a way I could never explain. In fact, they were the center of my college essay, my yearly school project, and even the front page of my school’s quarterly paper. Without my love and passion for dolphins stemming from my experiences at the DRC I would never be the person I am today. I cannot wait to share my loves for dolphins with the ones less fortunate than me. My interest in dolphins probably started with the Flipper Show of the 60's. I was young and fascinated by the intelligence and playfulness. Went on to intermittently read up on stories ever since. Bought the Cousteau book Dolphins which has some fabulous stories. So it was very exciting that on a trip to Miami in the early 1990's, was able to get a swim in at the DRC. Exceeded all expectations ! ! ! Have been a past supporter since and get the regular feeds on Facebook, which I will occasionally share. 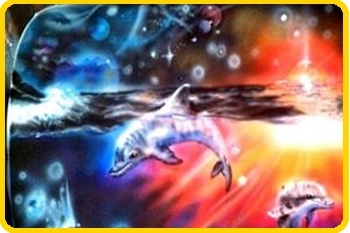 Love the programs which I would loosely describe as "Dolphin help for those who could benefit from it" as your programs have covered all sorts of people. I hope that the DRC will stay around forever! I came to DRC in 1993 and have never forgotten the experience. I swam with AJ, Merina and Aleta and had play time with Delphi and Kibby. I have treasured my newsletters and updates on the entire dolphin, sea lion and two-legged family there and have done my best to speak out and for marine life everywhere I go! I am so excited to be returning to the Keys with my mom in November. We will be planning some visits to DRC. Thank you so much, looking forward to seeing those beautiful gray faces!!! Upon discovering DolphinLab, I asked my mom if I could sign up. She told me that if I could make the money myself, I could go. Mind you, the likelihood of a 14 year old girl with no job in the middle of a small town in Maine is probably not going to make that kind of money. She never thought she'd have to put me on a plane by myself, So I started my own art business, selling airbrush tshirts. One year and many many tshirts later, I proved my mom wrong and had the money. I sent it down to you guys with my application and was accepted into your Basic DolphinLab program. Meeting your staff, the other students, and of course your beautiful dolphin/sea lion family gave me a look into the future that I want and made it all seem possible. I realized through meeting the dolphins that I CAN do it. I CAN have the life I have wanted since I was a toddler. It really concreted my dreams to be a trainer. 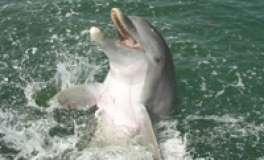 I want to help people through dolphins--disabled people, and those who have struggled and need to be reminded how happy life can be. That newly-reinforced dream lead me to start giving therapeutic horseback riding lessons! Also I should mention, you guys helped me with my pony. The training techniques I learned in DLab really helped (the woman I lease her from used more traditional training techniques with spurs and "showing who is boss"and nothing worked. She asked me to have a go at it but I took a different approach. So through what you guys taught me about positive reinforcement combined with many bags of peppermints and cookies, I have the most amazing relationship and trust with her)! So that is my story. Dolphins have been shaping my life for so long, and you guys have been a huge part of that. I can't wait to return this summer and meet the new baby girls. Thank you for listening and showing interest in your fans! The DolphinLab program at DRC was more than I imagined. Each day there was something new and exciting to be part of. My time spent at DRC was so valuable because of the hands on work I was given the opportunity to do. I learned about the many facets of working with marine mammals, their amazing dolphin family, their counterparts in the wild, and what I can do to help protect them and their environment. It provided me with learning by doing, interacting with the dolphins in the water and on the dock, understanding the importance of building a relationship with dolphins, and all within a professional and natural environment. My hands on experience at the Dolphin Research Center has continued to inspire me to pursue a career in the marine mammal field. From the classroom to being in the water with the dolphins it was an awesome experience. I come down each year as part of the volunteers with the Wounded Warriors Soldier Ride. I want to thank you for all you do for them and how welcome and at ease you all make them feel. The time with the dolphins is something they talk about for the remainder of their trip. Thanks for all you do!! And you make the best desserts for lunch! 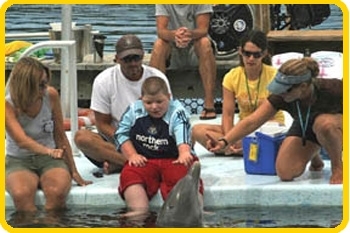 Alberto gives a member of our family a handshake during his swim with the dolphin program. 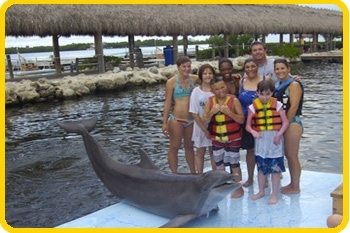 Bring your family to meet our family in the fabulous Florida Keys! 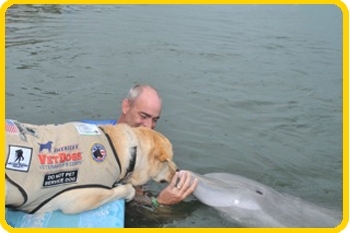 Dolphins are very social and enjoy meeting new people - and dogs too! 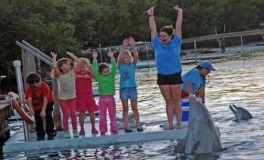 A child says hello to a smiling dolphin in the Florida Keys. 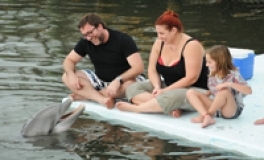 Our DolphinLab students get to work firsthand with our dolphin family members. 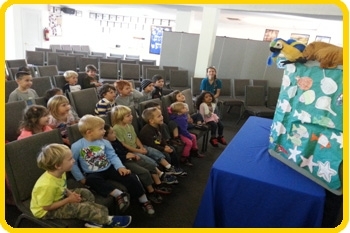 Dolphin Research Center stops by a classroom to teach children about marine mammals. 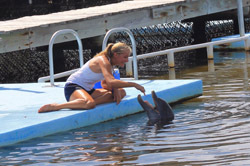 These guests enjoy their in-water program with the dolphins. 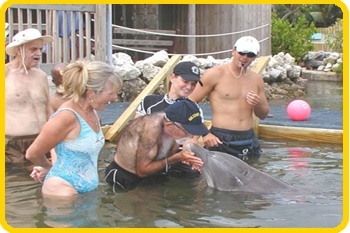 Dolphin Research Center offers additional assistance to any guests who need it for their swim with the dolphin or other interactive programs. 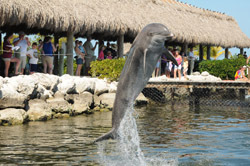 Have a finspirational story about your time at Dolphin Research Center or know someone who does? Send them to us!